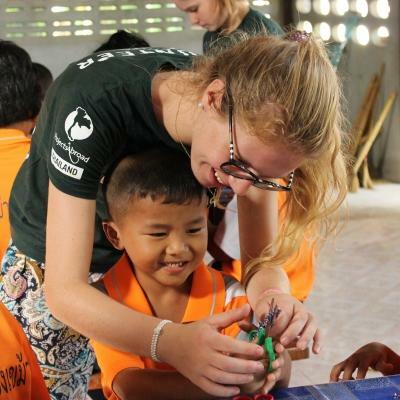 Volunteer with children in Thailand and gain practical experience while giving back to those who need your help. You’ll work in daycare centres and kindergartens, and support early childhood development. You’ll also teach English and make sure the children practice good hygiene every day. You’ll work with children from different backgrounds, and focus on supporting the work of local teachers and caregivers. Many of the children come from disadvantaged families. Getting practical childcare experience adds value to your CV, which can be useful for your future career. 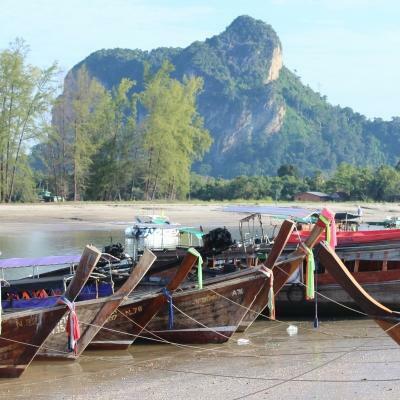 Free time and weekends will be yours for exploring the stunning location of Krabi. Swim in the warm ocean, bite into new and delicious foods, or plan a diving trip to explore underwater corals and marine life! 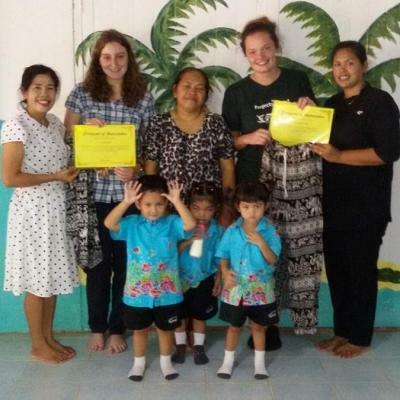 Is Childcare volunteering in Thailand right for me? Volunteer work with children in Thailand is perfect for any person who enjoys working with kids, and wants to help those in need. This project will suit you if you’re full of energy and excited to help where it’s needed. This project is also a good fit for you if you’re considering working with children professionally. No experience? No problem! You’ll have an induction on arrival and we’ll teach you what you need to know. We also run regular workshops for all Childcare and Teaching volunteers where you can share ideas, and discuss challenges. You can also reach out to Projects Abroad staff for help and advice at any time. The project runs throughout the year, and you can join at any time from a minimum of two weeks. We encourage you to stay longer so you can have a bigger impact on the children. 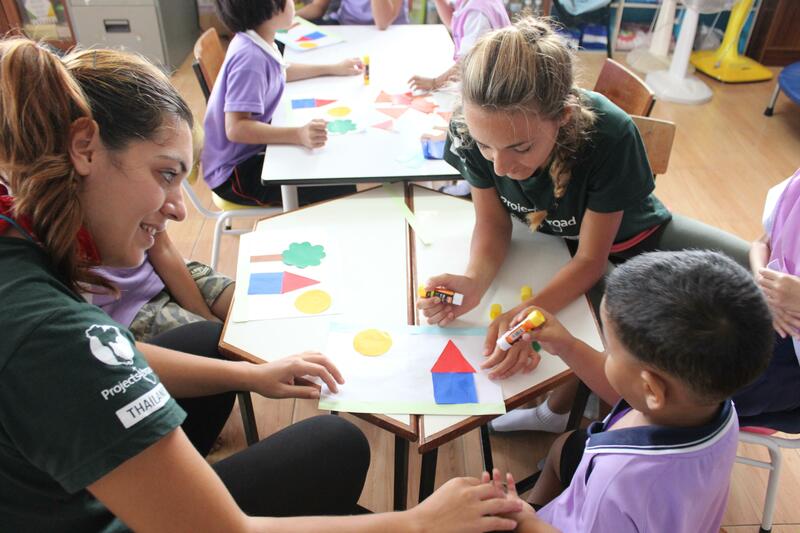 What will I do as a volunteer with children in Thailand? Early childhood development is crucial for children in their early years. The skills they learn will continue to shape their education for years to come. There are so many things you can do, and we have a number of resources available for you! Speak to your Projects Abroad Childcare Coordinator, use our online database, or speak to other volunteers in Thailand for ideas. In Thailand, tourism is a large contributor to the economy. English is the common language used to buy and sell, or communicate. Use your volunteer opportunity with children in Thailand to help boost the children's English confidence, and get them talking! You can do this by playing ABC matching games or English Bingo, or teaching them a simple nursery rhyme. The more energy you bring to your placement, the more engagement you’ll get from the kids and from the staff. Volunteer work with children in Thailand will include teaching children how to wash their hands correctly, or how to brush their teeth effectively. You’ll help caregivers and teachers with activities, or you’ll be asked to come up with a fun song, game, or activity. Keep in mind the age of your children, and alter the activity to their age. You will work in care centres or kindergartens based in Krabi. The placements we work with have basic resources, like a simple blackboard and chalk. You’ll need to think outside the box to create fun and educational activities that don’t require too many resources. Krabi is a small town, with an approximate population of 400 000. You will see many shops, local markets, and restaurants in and around town. You will live with a host family for the duration of your project. Some host families live in traditional homes, while others live in town homes. You will also have the option of living in shared bungalows with other volunteers. Free time in Thailand is exciting and different from anything you might have experienced before. Learn the true art of “chill” as you and watch a beautiful sunset with friends from all over the globe. You’ll also see some of the most beautiful beaches and meet the friendliest people. Each day, you’ll have breakfast in your host family home before leaving for your placement. Make sure to pack formal and semi-formal clothing for your project. Your shoulders, chest, stomach, and ankles should be covered. You can wear closed shoes that can be easily removed. A typical day on your project in Thailand will run from Monday to Friday, 8am to 1pm. You will leave your host family home everyday at 7.30am to get to your placement on time. You will be picked up from a pre-arranged meeting point, and taken to your placement. You’ll work in a care centre or a kindergarten. 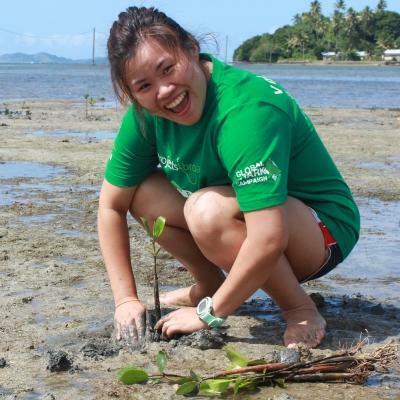 Volunteer work with children in Thailand is busy, and will keep you on your toes! You will take part in morning exercises, and start with classes. These include arts and crafts sessions, English lessons, and hygiene lessons. You can also speak to staff to introduce new and exciting games and activities for the children. You’ll eat a packed lunch at your placement. In the afternoons, you’re more than welcome to stop by the Projects Abroad offices in town to prepare resources for the next day’s activities. Make paper plate animal masks, create flashcards, or chat with the Childcare Coordinator about some new ideas you have! Weekends and free time in Thailand are yours. Catch a few rays of sunshine on Ao Nang’s beautiful beaches, plan a diving adventure, or take a long-tail boat ride out to a nearby island for a relaxing afternoon. What are the aims of this Childcare Project? The aim of this project is to promote early childhood development in the care centres and kindergartens that we work with. We also want to support the work of local teachers. They need extra pairs of helping hands to make sure that each child benefits from games, activities, and exercises. 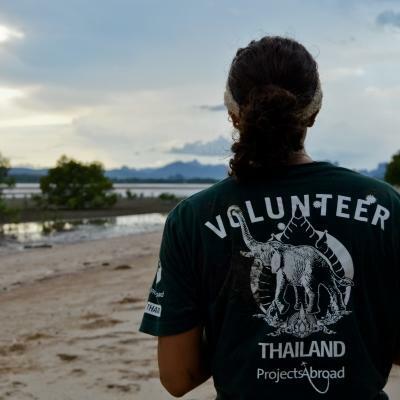 We have a number of volunteering opportunities with children in Thailand for you to get involved in. 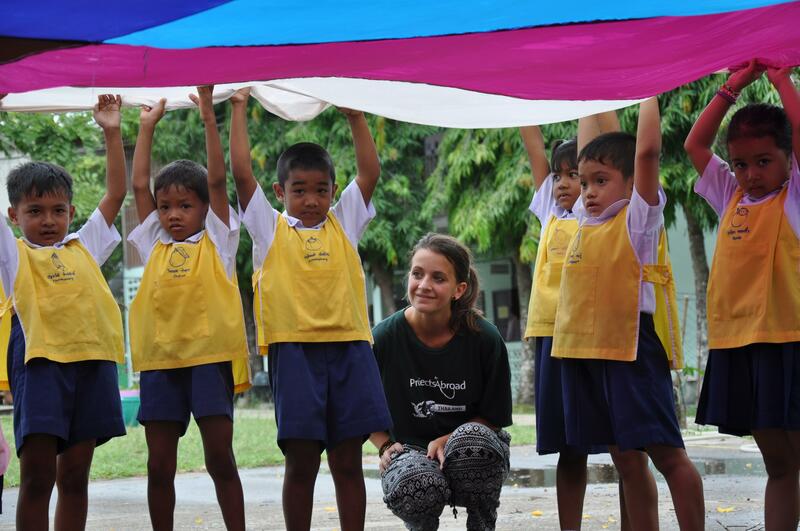 In Krabi, we work with care centres and kindergartens that have children from different backgrounds. Many of them come from disadvantaged families. English is an important skill for locals here, as tourism is a major economic booster in Krabi and in Thailand as a whole. You’ll work to help children feel comfortable with conversational English, and for them to be comfortable when engaging with tourists when they’re older. Help us achieve these long-term goals by joining us as a Childcare volunteer in Thailand. Seeing the children so happy really made me fall in love and enjoy what I was doing. After being in the day care for a few days the children were able to say my name and use basic English words such as the names of animals and colours.